DASH-NY’s work focused on creating a healthier New York State. 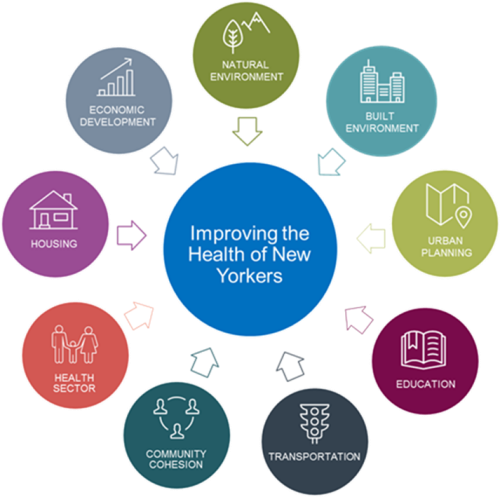 DASH-NY partners came from multiple sectors, including transportation, agriculture, economic development, planning, education, academia, healthcare, and more, to develop sustainable, cross-cutting strategies to prevent chronic disease and promote well-being across New York State. Reducing chronic disease in New York is a priority for our communities and should be a priority for our government. As of January 2015, there were 100 organizational members of DASH-NY. The DASH-NY Coalition members represented a diverse group of organizations from across New York, including state, city, and municipal agencies; educational institutions; community based organizations; research and policy organizations; health care facilities; school districts; and private-sector companies working on a broad range of issues such as agriculture, economic development, active transportation, and school policy. The following member organizations contributed to the creation of DASH-NY’s policy priorities and action plan through workgroup participation as members of the Steering Committee. They utilized the Coalition network to raise awareness of emerging issues and trends in chronic disease prevention. Partner Organization members share DASH-NY’s vision for a strong and healthy New York, as well as contribute to advancing the policy priorities. Interested in learning more about DASH-NY and coalition advocacy? Our webinar, Engaging in Advocacy: An Introduction to State Level Advocacy and the DASH-NY Coalition provides insight into how your organization can help make change. Allocated $300,000 to pilot a local food procurement incentive program in Assemblywoman Addie Russell’s district. $7 million in funding from the Environmental Protection Fund to expand environmental justice programming, including outreach to improve the environmental and public health of disproportionately impacted communities. Increased operating funds to upstate transit by $5 million and to non-MTA downstate transit by $17.4 million. Created the first multi-year capital plan for non- MTA transit. The DASH-NY Food Policy Workgroup sought and secured increased operating funding to continue the operations of current NYS projects including the Healthy Food and Healthy Communities Fund and the Healthy Corner Store Initiative and new funding to pilot a local food procurement incentive program, representing a total of $800,000 in 2016. The DASH-NY Healthy Schools and Childcare Workgroup advocated to maintain funding for Farm to School grants throughout NYS to improve the supply of healthy, local produce to public schools, representing a total of $350, 000 in grants, including state and federal funds in 2016. The DASH-NY Economic and Community Development Workgroup advocated to maintain funding to support food infrastructure, including farmers’ markets, shared-use kitchens, and healthy food processing, resulting in $350,000 for the Fresh Connect Farmer’s Markets program in 2016. This workgroup also won increased funding for non-MTA transit systems throughout NYS and advocated for the creation of the first multi-year capital plan for non-MTA transit. The DASH-NY Active Communities Workgroup made an impact with a step forward to establish dedicated state funding in the Assembly One-House Budget for Complete Streets in New York State and expand the scope of current state law to include all roadway projects. The Clinical and Community Linkages Workgroup achieved the maintenance of funding to secure policies & support initiatives targeted at chronic disease prevention and the disparities that exist in these areas. Although funding was increased for cancer, HIV/AIDS, and substance abuse, funding for other chronic diseases remained flat in 2016. The DASH-NY Coalition participated, as one of ten groups in communities located across the country, in field testing the National Quality Forum’s Improving Population Health by Working with Communities—Action Guide 1.0. Selected by NQF from a pool of 40 applicants, the groups provided on-the-ground testing of the guide over the 18 months. January of 2017 Governor M. Cuomo announced that each state agency would now use a “Health Across All Policies” approach to ensure that its work has a positive impact on health, whenever possible. This represented a key step in DASH-NY’s efforts to advocate for a healthier New York State. Since 2010, DASH-NY has brought together partners from multiple sectors to focus on policy, systems, and environmental changes that prevent chronic disease and promote well-being across New York State. Our government is an important partner in this effort, and “Health Across All Policies” reflects our state government’s commitment to improving and prioritizing health. 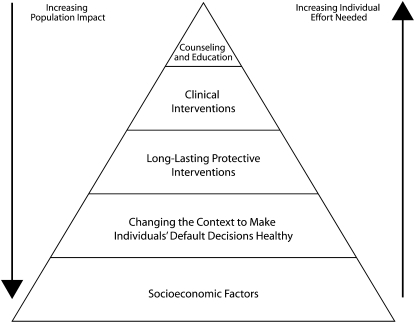 A Policy, Systems, and Environment (PSE) change approach goes beyond simply addressing clinical interventions to improve community health. PSE expands the reach of prevention efforts by looking at health from a population stand point. Instead of focusing on preventing or changing individual behaviors, PSE looks at how a community, government, workplace, school, and home can be adjusted to effect change in a multitude of persons. PSE works through three avenues of change to address the social determinants, structural determinants, and environmental determinants of health. Drawing from Frieden’s Framework for Public Health Action: The Health Impact Pyramid, DASH-NY focused on the socioeconomic and contextual factors that impact the health of New Yorkers, by supporting initiatives that make the healthy choice the easy choice—making it easier for all people to safely walk, bike and be physically active in their communities; promoting regional food distribution centers and local economic development; encouraging mandatory recess policies in schools and childcare; promoting breastfeeding; and supporting food policies regarding healthy food procurement and healthy food retail, reducing sugar-sweetened beverage consumption; and urging support for the federal Food Stamp Program. When public health professionals take a policy approach to making population level changes, they aren’t just looking to change laws. A policy can be any rule, law or guideline that impacts how institutions or organizations operate. By adjusting a rule or guideline, public health professionals can change how an entire system and environment operates. For example, shared-use agreements allow spaces such as school playgrounds to be open to the entire community after school hours. A policy clarifying shared-use for public schools eases the process. Learn more about shared use policy from our New York Shared-Use Agreement Policy Guide. Systems change is often the most difficult of the three. Systems are entrenched in our society, and often require multiple levels to work together to create a difference. System change can often be targeted by coalitions, policies, or committees working together. Chronic disease often addresses food systems. For example, a country-wide initiative called Farms to Schools links local farms and their produce to school cafeterias. This food system change enables schools to receive healthy fresh produce at reasonable prices. The conventional food system that puts farmers and schools at two ends often results in processed food or lower-quality foods. When farms link directly to schools, schools can choose their produce with minimal processing. See more on this from our Food Procurement Fact Sheet. Environmental changes are changes to public surroundings. This can include transportation, outdoor space, indoor space, grocery store access and interiors, and many more. Changing the environment in a community can have impressive effects on health. Complete Streets is an example of environmental change to increase physical activity. Complete Streets works to make travel modes accessible to all users. The model works by addressing all aspects of transportation, including improving bike paths to increase biker safety, adding benches on sidewalks for rest breaks for senior citizens, and adding trees to improve the aesthetics. These changes have been shown to increase community use of multiple forms of travel. Learn more about Complete Streets.